Realistically, if I shoot for all of them (and I am), it might not be until the following weekend. But we’ll see. I’ll keep you posted. Update (5-10): I may have been a bit ambitious guestimating two weeks for these three features. It’s been two weeks now, and I’m partway through all of them. I should finish the multiple saves tonight. Maybe I’ll push that to apple for approval before the other two, but I’m not sure yet. So far, I’ve got about a half-dozen puzzles for puzzle mode. It’s harder to make puzzles than it is to solve them, but I’m far enough along that I’m now confident it’s worth the effort. 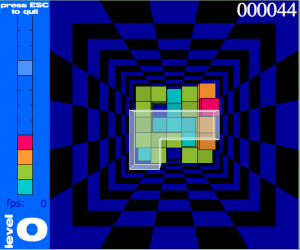 My only worry is that it may be difficult for me to make mid-level difficulty puzzles. So far all of them have been really easy, or really pretty hard. We’ll see. I’d like to launch the feature with 100 puzzles. I don’t know how realistic that is, but it’s my goal for now. ActionChess 0.1.1 was released last Thursday (along with ActionChess Lite). I submitted another update to ActionChess tonight that fixes a bunch of bugs (see below). I think ActionChess Lite will probably lag a day or two behind it, since I just need to port these changes to it. 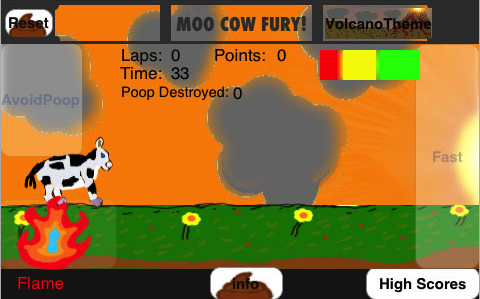 I wanted to get a lot more into the second ActionChess update, (how about a new game mode or two?!? ), but alas it was just not to be. I had too much going on this weekend, and too many bugs to squash. Special thanks go out to my friend and co-worker Justin (Dez) for finding a lot of these bugs the day the update was released. Thanks Dez! ActionChess “Lite” Submitted to the App store! I spent some time yesterday… and again some time today… getting ActionChess Lite all ready to go. I decided on allowing three game types, 3-minute Timed Mode, Specific Piece Mode: The Whole Set, and Specific Piece Mode: Bishops. I went back and forth about that last one. I thought about choosing Queens, but feel like it’s too easy. Thought about Pawns, but that’s too hard. Bishops is a nice compromise, I guess. 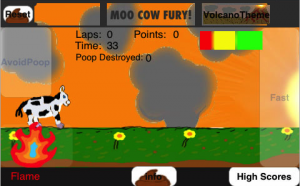 I also gave away a bunch of promo codes for the game today on Touch Arcade. I hope that got it some much needed eyeballs, and I also hope it wasn’t premature. The impending 0.1.1 release should fix a whole bunch of bugs, and generally performs much better than 0.1 did. (I hope that gets approved soon.) If it’s not approved by Wednesday, I’ll probably send an email. It’s been a week and a day already, although I suppose technically I re-submitted the binary a week ago today. I don’t know what that does for the app submission “queue”. The other big thing that took the most time about the Lite version is that I decided to incorporate AdMob ads into the menu screen. They’re at the top of the screen, where you don’t click anyway, and as soon as the app is released, I’m going to switch it to display (as much as possible) only the link exchange ads. This means it’ll just show ads for other games that show ads. 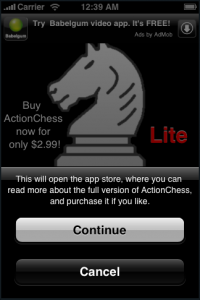 And then those games will show ads for ActionChess Lite… hopefully exposing more people to ActionChess who might not otherwise have seen it. It’s all about the evangelism here, not about making money. (I’ve seen the statistics on how many views you have to get to make money on iPhone ads, and it just doesn’t seem worth it at this point.) Anyway, hopefully the ads won’t detract from anyone’s enjoyment of the game. There’s also a handy button to purchase the full game from the App store. The button doesn’t take you there before asking if you’re sure though. I don’t want anyone getting pissed off about that. Obviously, the screenshot shows that dialog in action. 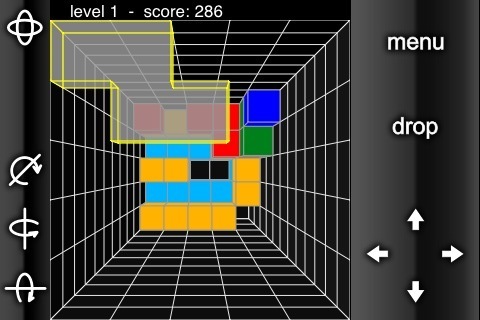 Claustrophobia, by David Leblond, is a collapse-like color/shape match-3 game (the shapes are new in this update). 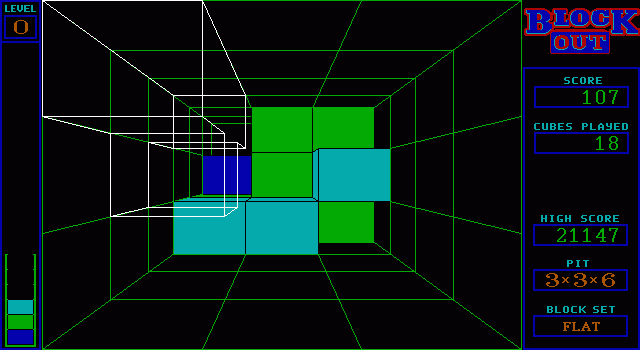 You’ve basically got a bar in the middle of the screen, and that’s where you’re releasing your blocks from. Blocks can either launch upwards or fall downwards, and if they hit or make a group of two or more of the same color/shape, then that group is removed from the game. If blocks are left without anything underneath them (or above them), they’ll fall, and in the case of the top gameplay area, they’ll fall all the way down to the bottom gameplay area, possibly scoring you big points, or possibly just mucking things up for you down there. 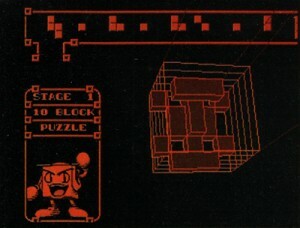 The game’s namesake comes from the fact that both the top and bottom blocks are moving continually toward the middle, and when either of them reach it, that’s game over. There are special types of blocks that slow or speed up the block movement, and some of the strategy comes from knowing when to use or avoid them. For a very, very brief period of time (two days, I think?) I had the high score on the “Normal” game mode of Claustrophobia. David took that score back from me shortly thereafter, although neither he nor I can come close to the scores getting submitted for “Easy” mode. Go figure. DropOut, by Curt Stein, also involves falling blocks, but you don’t control when they get released, they just fall all at once, as the row at the top of the screen fills up. If you have any column of blocks all the way to the top of the screen (thus blocking any part of that row from falling), then the game vibrates at you angrily a few times before game over. 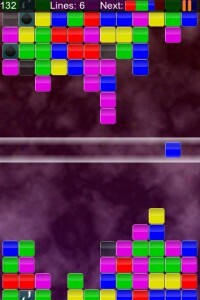 You can move the blocks that have already fallen either left or right, and they’ll wrap around the sides of the screen. 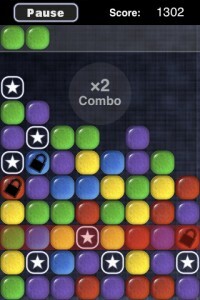 Whenever a group of 4 or more blocks of the same color is made, those blocks are removed from the game scoring you points and making combos. DropOut also has both bad and good special blocks, the good ones have stars on them and are basically just worth extra points (but they’ll fall off the bottom of the game if you let them get all the way down to the last row). There are also locked blocks, that prohibit the movement of their entire row. This is where the strategy comes in, and the game transcends a simple one-dimensional Yoshi’s Cookie clone. DropOut can get really intense after you’ve played for even just a few minutes, and I found myself getting done with a game and realizing I’d just been playing one game after another for over an hour. For about a week after the game’s release, I also had the global high score for DropOut. Both of these games are super fun, and well worth picking up. I’ve actually emailed back and forth with both developers, and they have been super approachable, and given me the advice I’d been asking for in regards to my own iPhone development. I’m excited to play with the updates and see what’s been changed. Highly, highly recommended.